Fiji and Papua New Guinea meet in a World Cup qualification test match next weekend that create the first official Oceania test champions for a decade. Although a significant step forward for Pacific Island women’s rugby, the game is in practice a remnant of what was originally planned to be a far more ambitious and complex process for deciding the eleventh and twelfth qualifiers for next year’s World Cup in Ireland. World Rugby’s original plan was for a qualification process that would climax in a tournament involving the champions of Asia. Africa and Oceania (plus the Asia runners-up), with pre-qualification tournaments in Asia and Oceania (South Africa were given a bye to the final qualifier after World Rugby ruled that Kenya and Uganda did not have a sufficiently robust domestic programme). However, South Africa withdrew from the process last year. Then, earlier this year, Kazakhstan also withdrew from the Asian Championship at the last minute, leaving no time to find a replacement team in the what was supposed to feature the continent's top three test teams. So both the remaining teams – Japan and Hong Kong – moved forward to December's playoff. After such disappointments in Asia and Africa, Oceania provided more positive news with three teams initially stepping forward – Fiji, Papua New Guinea and Samoa. With their long history of World Cup participation, the latter seemed to be favourites to become the region’s entry. However, in a surprise move, Oceania Rugby then refused Samoa’s entry on the same grounds as World Rugby had barred Kenya and Uganda – the lack of a robust domestic women’s fifteens rugby tournament (almost all of Samoa’s squads in past years have come from players living and playing in New Zealand and Australia). As a result, only two teams remain in Oceania – Fiji and Papua New Guinea – to compete for the region’s title, with the winner to meet Japan and Hong Kong in December to compete for two places in Dublin. A final problem has been the scheduling of the Oceania Sevens Championship (also in Fiji), which will start just six days after the World Cup playoff. Bai, who who recently hung his boots after helping Fiji win the Pacific Nations Cup this year, now heads the Fiji Rugby Academy. Earlier this month he explained the challenge he faced to local journalists: "I was asked to come and assist the team [by women's development officer Vela Naucukidi] as we try to make the Women's Rugby World Cup next year so I brought in Doviverata, Saula, Ben Soso and Vueti so that we could help these players,"
"The women are either new to the full code or had only a couple of years experience. Most are yet to understand their roles in breakdowns and what they need to do in terms of their positions. The most important thing that we need to see from here is that the players understand their role and how they need to play their game not only technically but also tactical in any given game situation," he said. As well as missing the Fijiana sevens players, Bai’s squad will also be missing players who have now moved to France. Even so he started with an initial squad of 48 players, which this week he trimmed down to the final 26-player squad. Fiji Rugby Union CEO John O'Connor congratulated the team on their selection and reminded them of the huge task ahead of them: "I would like to congratulate you on your selection but at the same time remind you of the task at hand which is to win the match," he said. "Playing in front of your home crowd will be a huge challenge, but that should not deter you in reaching that goals. PNG will be a tough team to encounter and you should not take them lightly. Go into the match with a positive attitude that you are going to win and make us proud." Fiji Squad: Leilanie Burnes, Jowana Vuni, Esiteri Bulikiobo, Makereta Tunidau, Pasemaca Buadromo, Vilisi Vakaloloma, Merevesi Fuga Ofakimalino, Laisa Taga, Joma Rubuti, Sereana Nagatalevu, Sereima Leweniqila, Ema Adivitaloga, Mere Moto, Rusila Tamoi, Rejeli Uluinayau, Tavaita Rowati, Merewalesi Rokovono, Mereani Moceituba, Talica Vodo, Salote Vakaturi, Alisi Komaitai, Paulina Ravouvou, Wainikiti Deku, Roela Radiniyavuni, Limaina Wai, Litiana Lawedrau. Papua New Guinea’s RFU has faced similar scheduling problems due to the sevens championship but unlike Fiji, all of their sevens squad have also been called up for the test match squad, Including Brisbane-based sisters, Marlugu and Harkana Dixon. Of the rest of the test team Debbie Kaore stands out - she is a Pacific Games boxing gold medallist. Most of the other players in the squad have international sevens experience, though Melanie Kawa (who played for Montpellier in the French Top 8 last season), Nina Stein and Augusta Livuana will also be making their international rugby debuts. 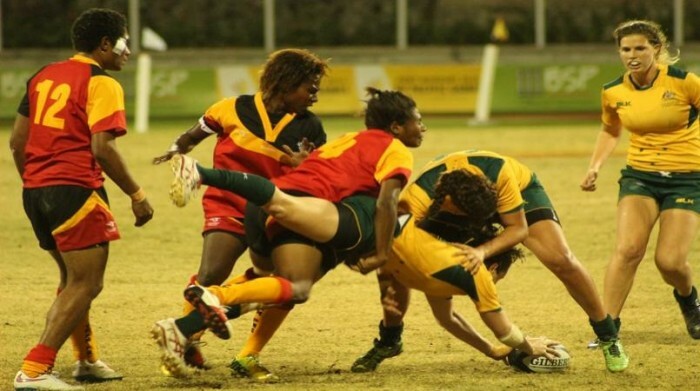 Papua New Guinea Squad: Jane Buku, Clara Biyamah, Michaeline Lawrence, Angela Parao, Pamela Waringe, Mavis Mitaharo, Margaret Naua, Isi Geno, Norah Waiga, Lorraine Pomat, Fatima Rama, Tracey Stanis, Melanie Kawa, Nina Stein, Victoria Kamen, Lynnette Kwarula*, Debbie Kaore*, Kymlie Rapilla*, Joanne Lagona*, Cassandra Sampson*, Taiva Lavai*, Geua Larry*, Thereseanne Daimol*, Helen Abau*, Augusta Livuana*, Harkana Dixon*, Marlugu Dixon*. Is it the first, second or third Oceania test championship? Its also arguable that the winners will not be the first Oceania Champions, as in August 2009, in Apia, Samoa took on Australia in a previous Oceania World Cup qualification match (and therefore, arguably, Oceania Championship). Fiji had also been due to take part, but withdrew - and Australia won the game 87-0.